if there was no pleasure in the climb." 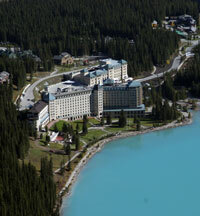 The Canadian Rockies have a vast array of possibilities as far as hotels, inns and hostels go. From back country lodges to luxurious hotels - you choose what will make your stay unforgettable. Begin first by picking a location and go from there. What is the Icefields Parkway? The Icefields Parkway, also called Highway 93, is one of the most scenic highways you will ever drive. Rent a car and make your way up to Jasper or book a great motorcoach tour with commentary that will reveal an exciting history! Imagine what it must have been like for those early mountain travellers. Where will this highway take me? The K-Country is probably most loved for its rugged landscapes and beautiful vistas. This place is a real gem and has been loved by local Albertans for years. Located just an hour west of Calgary, the Kananaskis, is easily accessible and is popular for many reasons. Hiking, golf, camping and adventure sports are just some of the activites people go to this mountain paradise to enjoy. Looking for some winter fun? Pay a visit to Nakiska Ski Hill, the site of the 1988 Winter Olympic skiing competitions. Feeling not so rustic? There are deluxe accommodations and great restaurants for a weekend getaway!